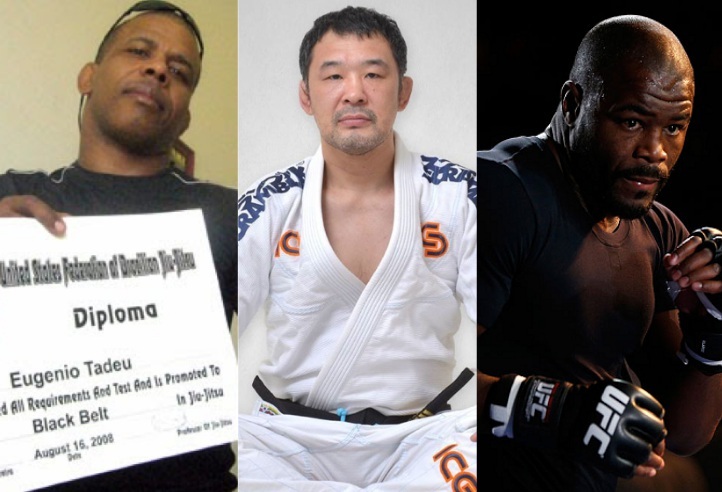 понедельник, 31 июля 2017 г.
http://jiu-jitsu.news/16-jiu-jitsu-practitioners-that-were-promoted-straight-to-black-belt-part-2/We continue to talk about the owners of the BJJ Black Belt. John Lewis was a Gene Lebell black belt who was promoted straight to BJJ Black Belt by Andres Pederneiras between EFC 1 and EFC 2. Bosnian 4th degree BJJ black belt Arvin Widder was a Yugoslavian National Judo champion and started training BJJ in 1998 at the urging of his friend Fred. In the beginning he practiced a combination of judo and jiu-jitsu, or more precisely – kosen judo. Two years later he went to the U.S. (New Jersey) in the club where he was then practicing BJJ: Team Edson Carvalho. He met Edson Carvalho, a master of judo and a 5th degree black belt in BJJ. In 2001, he went back to the U.S and trained more with Sensei Edson, and actually started to understand the concept of BJJ as a whole. In 2003, he organized the first BJJ seminar in Sarajevo, Bosnia with Sensei Edson, who promoted him directly to BJJ black belt, thus becoming the first Bjj black belt in Bosnia and the second in the territory of former Yugoslavia. UFC fighter and catch wrestler Josh Barnett was awarded a BJJ black belt from Erik Paulson without having ever worn a Gi! UFC fighter Rashad Evans received his black belt in Brazilian Jiu Jitsu from Rolles Gracie before UFC 108. Rolles Gracie stated that even though Rashad has not trained in a Gi, that he considered him at ‘No Gi black belt level’. Sheikh Mohammed bin Zayed, Crown Prince of Abu Dhabi and Deputy Supreme Commander of the Armed Forces, is instrumental in the growth of Jiu-Jitsu on a local and worldwide level. He developed the plan of of having Jiu-Jitsu taught at all UAE schools. Although he was training Jiu-Jitsu on a regular basis, he was presented an honorary BJJ black belt by Carlos Santos. Japanese MMA legend Sakuraba trained Brazilian jiu-jitsu with the Gi under Cristiano. Saku was presented with an honorific BJJ black belt by Cristiano Marcello, which he humorously would confess in an interview that he never learned quite how to tie. Chuck Norris was promoted by Carlos Machado straight to black belt in BJJ. Norris kept training and now at 77 years old, he is a 3rd degree BJJ black belt. UFC fighter from the early days, Kimo Leopoldo was promoted by Joe Moreira straight to BJJ black belt. Kimo lost to Royce Gracie by armlock at UFC 3 after giving him a very tough fight.